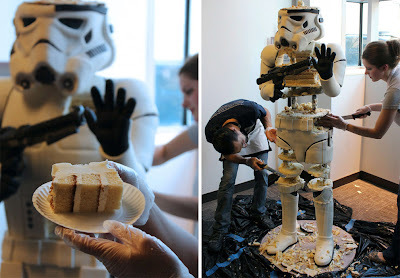 Strormtrooper's may have been the whipping boys of the Empire, but damn they looked wicked in the process. Now a fancy dress costume staple, the iconic suit of armour has been crafted out of a whole new substance, one a little less lightsaber proof yet a lot more filling. Cake. Standing at 6 feet 4 inches tall, the Star Wars based sugar-hit was crafted by Amanda Oak Leaf Cakes, designed to feed 600 convention goers at the Arisia Sci-Fi Convention in Boston, MA. Mmmmm I wonder if they have any leftovers? 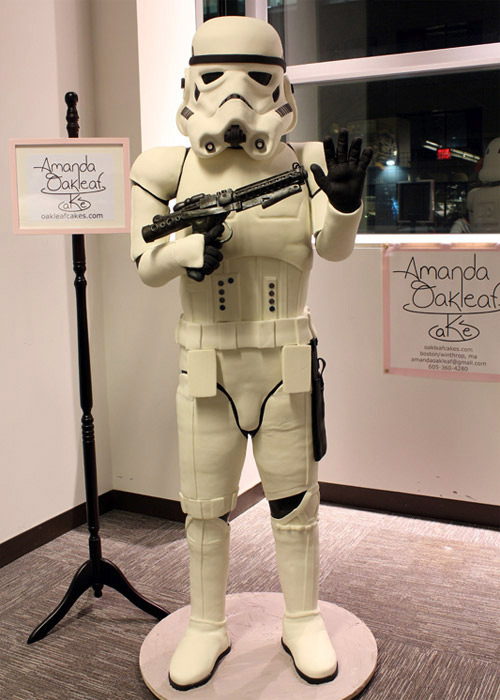 Visit Amanda Oak Leaf Cakes after the jump. Hey Stephanie, and welcome to IADW! You are right on, the cake looks fantastic, and if it tasted as good as the amount of brainpower ghat went into it, Id say those con goers left feeling pretty satisfied! ...I'm not showing this one to the kids. Nope. Not getting roped into that one this year. Ha be careful Random, if they find IADW in your history you could be in trouble!